The Damariscotta River at Dodge Point. This year the Land for Maine’s Future Program turns 30. Despite coming under fire from Gov. Paul LePage, who opposes most taxpayer-funded conservation projects, LMF has strong public support — since 1987 it has been bolstered by more than half a dozen statewide bonds that have helped conserve 600,000 acres and more than 150 destinations. Those destinations are now part of a marketing effort to get Mainers to access and enjoy the properties they own. The properties range from working waterfronts and public forests to remote swimming holes and scenic hikes. Some are dramatic and better-known locations like Mount Kineo, in the heart of Moosehead Lake, or the Bog Brook Cove Preserve, part of Washington County’s increasingly popular Bold Coast. And now LMF has organized a way to easily find these places. It’s being called a Passport, essentially a link to 35 recommended itineraries with information about outdoor activities that are welcome at each spot free of charge. “For me, one of the great gems is the Leavitt Plantation, which is in Parsonsfield, way over in northern York County, really good for mountain biking or hiking,” says Tom Abello with the Nature Conservancy in Brunswick. Angela Twitchell of the Brunswick-Topsham Land Trust. Abello says another favorite place is Dodge Point on the western shore of the Damariscotta River where you can swim, fish and hike on six miles of trails. Timber harvesting and hunting are also permitted in certain sections of the parcel, says Steven Hufnagel of the Damariscotta River Association, and they all coexist. This was the first project conserved by LMF back in 1989. The Damariscotta River Association co-manages the property with the Maine Department of Agriculture, Conservation and Forestry and other groups. And like so many other LMF projects, Hufnagel says it likely would have been logged and divided up and sold as house lots with a permanent loss of access to the shore. Minimizing sprawl and protecting access to the water is one reason LMF was amended in 2005 to allow for the inclusion of farms and working waterfronts. At Crystal Spring Farm in Brunswick, about a dozen pigs are raised for meat as part of one of the largest CSAs in Maine. 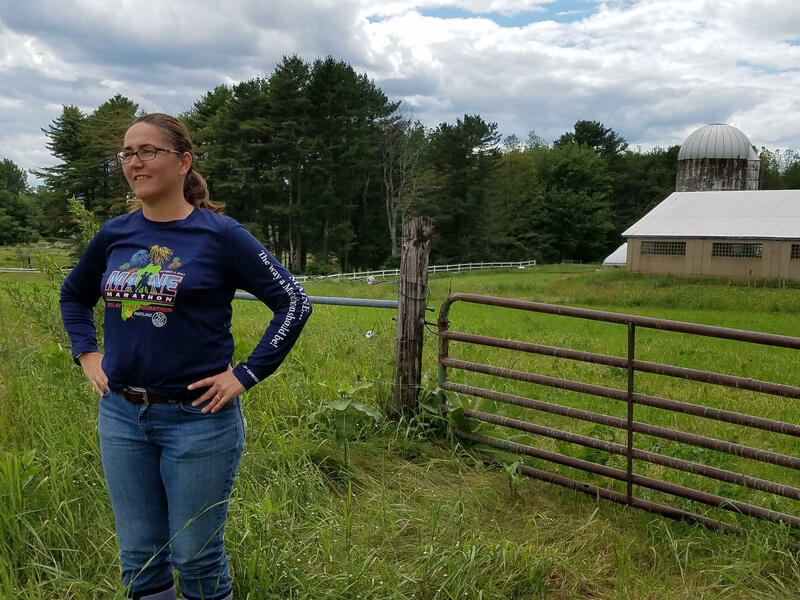 It was formerly a dairy farm, and when it came up for sale, Angela Twitchell of the Brunswick-Topsham Land Trust says her group worked hard to protect it. They raised more than $2 million on their own and were awarded an additional $400,000 by LMF. 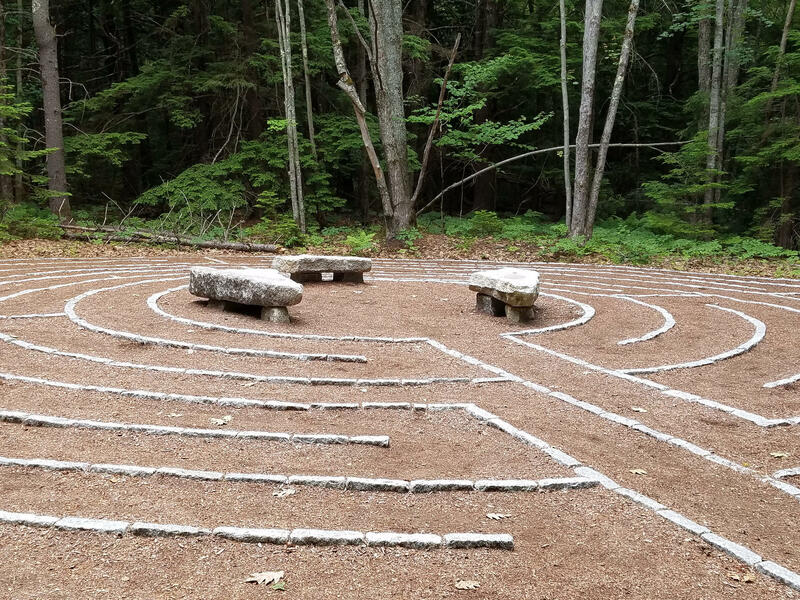 The labyrinth at Crystal Spring Farm in Brunswick. “Crystal Spring Farm is about 320 acres and we lease about 100 acres of that to a farmer who grows organic vegetables and various other things and the rest of it — we have about a six-mile trail system. We have a community garden where we have about 83 plots that community members lease and grow their own food. And we have a farmers market,” she says. Twitchell says with more than 40 vendors, the farmers market attracts as many as several thousand people, some of whom also take their dogs walking on the farm’s trails or meditate in the outdoor labyrinth that has been set up in some nearby woods. Other destinations and activities can be found on the LMF Passport website. This story was originally published July 19, 2017 at 5:46 p.m. ET.